BEIJING — China’s economy grew slightly faster than expectations in the second quarter of 2016, stable from the first quarter and fueling hopes that the economy is heading for a steady but slower period of development. The country’s GDP grew 6.7 percent year on year in the second quarter, according to data released by the National Bureau of Statistics (NBS) on July. The figure, though the lowest quarterly rate since the global financial crisis, remained within the government’s targeted range of between 6.5 and 7 percent for 2016. On a quarterly basis, the economy increased 1.8 percent from the first quarter. 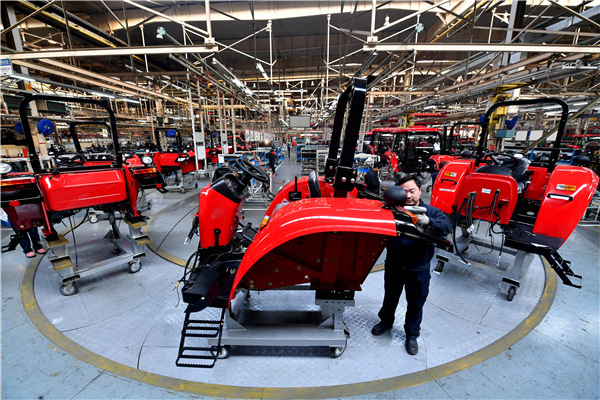 GDP expanded 6.7 percent year on year in the first half of 2016 to reach 34.06 trillion yuan (5.08 trillion US dollars). The stabilization in the second quarter suggested “the infrastructure-centric stimulus strategy, supported by a mixture of monetary accommodation and fiscal expansion has had some degree of success,” said Julia Wang, HSBC Greater China economist. NBS spokesperson Sheng Laiyun said the economy still faces “relatively big downward pressure,” but economic growth in the first half has laid a good foundation for the country to achieve its 2016 growth target. The economic stabilization is set to continue, with major indicators operating in a reasonable zone, supply-side structural reform and economic restructuring continuing to advance, and new growth engines picking up steam, Sheng said. The service sector expanded 7.5 percent year on year in the first half, outpacing a 3.1-percent increase in primary industry and 6.1 percent in secondary industry. It accounted for 54.1 percent of the overall economy, up 1.8 percentage points from a year earlier. Industrial output expanded 6.2 percent year on year in June, accelerating from a 6-percent increase in May. Retail sales rose 10.6 percent, a faster expansion from May’s 10-percent growth. The government boosted fiscal spending by 19.9 percent in June, bringing expenditures for the first half to 8.92 trillion yuan, up 15.1 percent year on year.